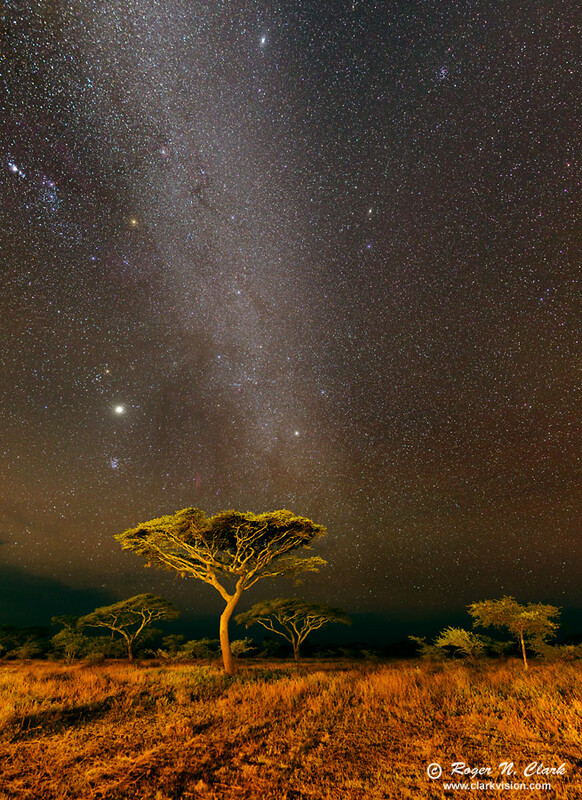 The Milky Way galaxy stands tall over the Serengeti in this view to the northwest from Ndutu. This view is about 110 degrees tall and 80 degrees wide in this 10-frame mosaic. The Pleiades star cluster is just above the left edge of the large acacia tree, and above the Pleiades is the planet Jupiter. Just above the largest acacia tree, center, is a red smudge: that is the California nebula, NGC 1499. The constellation Orion is at the upper left edge and with Orion's belt nearly vertical. The 3 stars in the sword has the bright Orion nebula (M42) in the center of the 3 stars. The sword stars point toward the north celestial pole, which is 3 degrees below the horizon near the left side of the image. The bright star at the center near the top edge is Procyon, Alpha Canis Minor. The small star cluster to the upper right is M44. The Milky Way Galaxy in this part of the sky is the faint part of the Milky Way, as we are looking away from the Galactic center. Toward the bottom of the image we see faint red and some green in the sky: this is auroral airglow. Visually, the northern horizon appeared bright, even though this is some of the most remote and darkest places on Earth. Lights from the Ndutu lodge illuminated the trees. Technical. Canon 1D Mark IV, 16 megapixel digital camera, 24 mm f/1.4 L lens at f/2. This is a 10 frame mosaic, with each frame 30 seconds at ISO 1600. Stars were tracked with a barn door tracker, hand cranked. The terrestrial scene was made with identical 30-second exposures and no tracking. The images were carefully assembled to select untrailed stars and unblurred terrestrial landscape. Full resolution image is 8846 x 12158 pixels, or 107 megapixels.